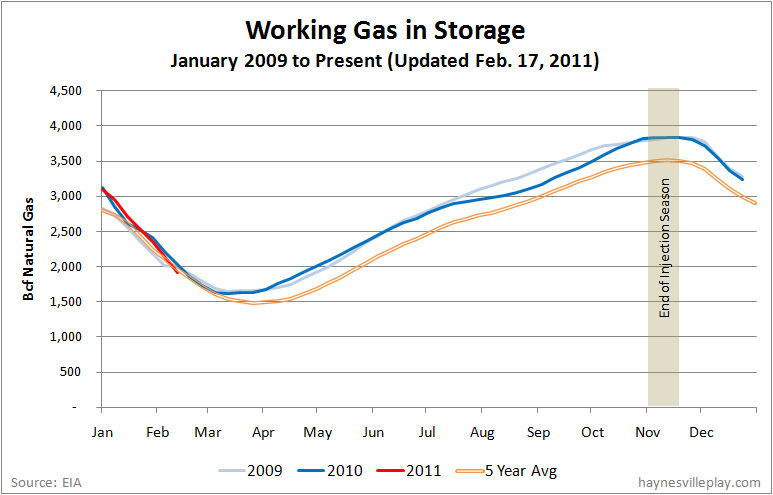 The weekly EIA working gas in storage report showed another big withdrawal of 233 Bcf, bringing the current storage level down to 1.911 Tcf. 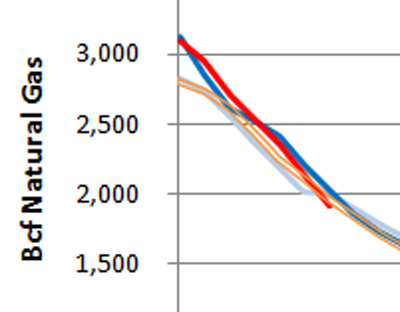 The weekly withdrawal was considerably higher than both last year (-141 Bcf) and the five year average (-128 Bcf). The current storage level is now 6.9% lower than last year at this time (2.052 Tcf) and 6.3% below the five year average (2.039 Tcf). Lest one think this is some kind of extraordinary move, keep in mind that the same week in 2008 saw a storage level of 1.77 Tcf. 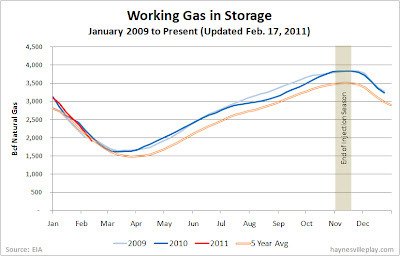 Storage that year bottomed out at 1.234 Tcf. I doubt we will see a repeat of that for a few years. Temperatures last week averaged 30.3 degrees, which was 4.9 degrees colder than the 5-year average and 2.1 degrees colder than this week year. Given the mild temperatures this week, don't hold your breath for such a dramatic move next week.